Descr. Cact. Nov. 26 (1957). Origin and Habitat: Haageocereus pacalaensis subsp. repens is endemic to a small area 10 to 14 km south of the city of Trujillo, Region La Libertad, Peru. Altitude range: 50-300 metres above the sea level. Habitat and ecology: Haageocereus pacalaensis subsp. repens grows prostrate on the sand near the coast of Trujillo. This Trujillo taxon is seriously threatened by an irrigation project (Chavimochic) and it is a matter of time to be replaced by an asparagus cultivation. The subsp. pacalaensis is critically endangered, but some of the plants have been rescued by the professors and students of the National University of Trujillo in 2005 and are planted in the campus of that University. As the entire original habitat of Haageocereus pacalaensis subsp. repens is rapidly being degraded or flooded for the irrigation project, a reintroduction within its habitat is not planned. However, it should be evaluated whether it can be introduced into another suitable area. Description: Haageocereus pacalaensis subsp. repens is a rare cactus species often included within (as a synonym of) Haageocereus pacalaensis, but distinguished by cylindrical stems crawling horizontally on the sand with ascending apexes (The stems in the standard H. pacalaensis are erect and easily tell apart at a glance). Stems: Prostrate, decumbent, up to 2 m long, 8 cm in diameter, with the raised apex. Root: Napiform root and adventitious roots along the branches. Radial spines: 40 thin, amout 1 cm long. Central: 1 to 2, up to 1.5 cm long. Flowers: White, 7 cm long, 3.5 cm wide. 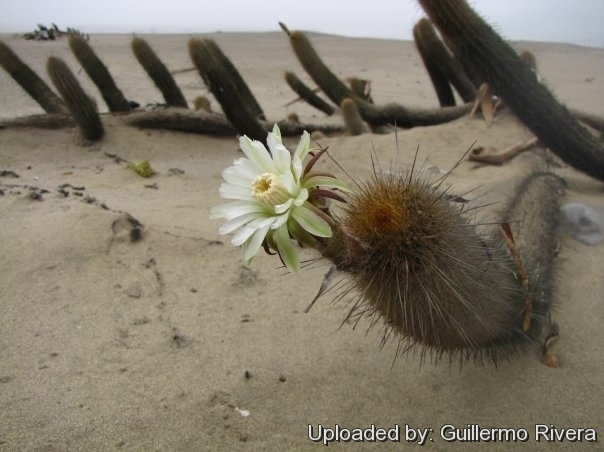 Note: This South American species has developed a prostrate growing habit similar to that of the 'creeping devil' Stenocereus eruca in North America. 2) Arakaki, M., Ostolaza, C., Cáceres, F. and Roque, J. “Cactaceae endémicas del Perú.” Revista Peruana de Biología 13(2): 193s-291s. 2006. 3) Ostalaza, C., Cáceres, F. & Roque, J. 2013. Haageocereus pacalaensis. The IUCN Red List of Threatened Species 2013: e.T152353A627212. http://dx.doi.org/10.2305/IUCN.UK.2013-1.RLTS.T152353A627212.en. Downloaded on 14 December 2016.